Just in case you haven't heard, Morphe Brushes eyeshadows have been taking the makeup world by storm recently ever since Jaclyn Hill mentioned them in her videos. So I've taken up her advice and got me some singles! I'll review the palettes in another review. These shadows are USD$2 per piece. YES $2! It is really affordable and lemme tell you, the quality you get with these babies.... I'd pay waaaaay more. Ok so onto the shadows. I've searched for reviews online before placing my order but really couldn't find many reviews on the singles. Those that I've read talked about the single eyeshadows being of a higher quality than those in the palettes. I got both to compare it for you guys, as well as for my own personal pleasure of course. Now I purchased the Morphe 35B Colour Glam Palette (review here) as well as these singles. Swatched them and played with em' and here's my verdict. The quality does differ a tad, the singles being slightly better. However, with a good eyeshadow base and decent brushes, you can't really tell the difference really. They come in a small black cardboard envelope and when you open it up, it looks like that of MAC and Makeup Geek. I love how there is this extra ring of styrofoam to prevent the shadow from being thrown around! Here are my overall thoughts on the single eyeshadows. 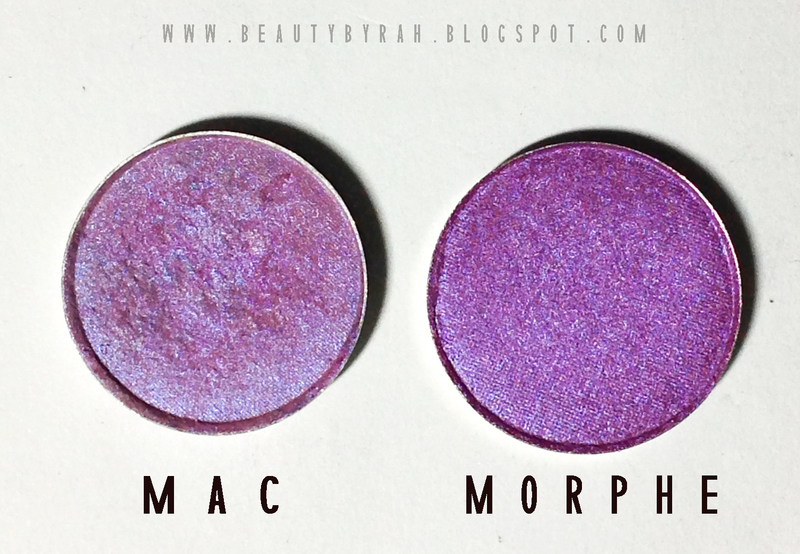 These shadows have really good pigmentation and they blend fairly easily. The texture of these aren't dry nor creamy but a tad powdery - be careful if you are heavy handed as plunging those brushes into these shadows will result in some powdery mess! These last a good 9 hours on me when I tested them without fading or creasing (with Urban Decay Primer Potion underneath). Some shades are more buttery than others - such as #55, #69 and #47. The mattes here are really good - considering that matte textured eyeshadows are the most difficult to formulate, I am applauding these matte shades. And for $2. Come on! I grouped them into groups of purples, browns & golds and reds for easier comparison in the swatches below. Swatches are done with one swipe with no primer and a light hand. Urgh these purples, they give me life. So pretty. #53 is not really what I would call a soft purple, but more of a burgundy plummish purple haha. #38 reminds me of MAC Stars & Rockets but a tad more pink rather than purple. I'll update here with a comparison swatch (which I regretfully forgot to take) once I find that mac shadow again - my makeup collection is in a midst of reorganising and super messy! #45 is a really deep blue and purple shade that appears close to a black when blended, but a gorgeous shade for a dark smokey eye if you ask me. The dual-intensity shades (#77 & #78) are way prettier in real life! The camera couldn't capture the duo chrome effect, sorry guys! These colours above make excellent lid colours! I can't even. Look at #69 and #47. I literally drooled when I swatched them. SO. DARN. GORGEOUS. Apparently #69 is a dupe for MAC Amber Lights (which I do not own so I can't swatch it for you. But I saw a swatch on reddit and gurl, I was sold). #78 is a really pretty duo-chrome shade that is super super close to Too Faced's Girly eyeshadow - I wished the camera could catch it! It is a reddish brown base with gold and green sheen to it. Super pretty. #77 also is a duo-chrome shade but the light purple sheen to it isn't as obvious. This shade required some building up as its pigmentation isn't as strong as the others. Sorry swatches are the other way around! You know I love me my reds! I always love adding a hint of reds/peaches above the crease to warm up my entire look and lemme say, #65 and #66 are perfect for that! #65 and #66's pigmentation wasn't as strong as the rest either so it requires you to work a little harder to get the colour on your lid to look like that of the pan. #71, oohhh, this one stole my heart. It is such a gorgoeus outer v shade. Pair this with a gold (like #69) and bam gurl, I'm done and fabulous. These pans also stick nicely to magnetic palettes such as my Z palette without the need for the steel plate! YES. Score! I highly recommend you check Morphe Brushes out guys! Regardless if you're a makeup artist or a beginner, these affordable eyeshadows ain't gonna do you wrong. Trust me. Even if you don't like it, you don't lose much money anyway. So give it a try! 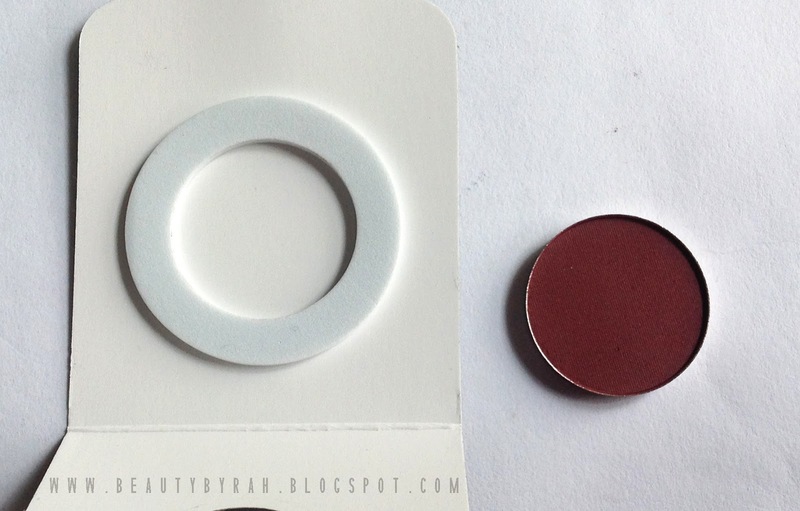 However, they are pretty popular and many of the single shadows are often out of stock! So do take note and grab em' if you like em'! They do ship internationally, but their shipping isn't the most affordable (It also isn't a flat rate, increases with net weight). My shipping to Singapore for these 14 singles and a brush was USD$14.48 for your reference. Despite that, it comes up to like USD$3 per shadow and dude, that is still hella worth. 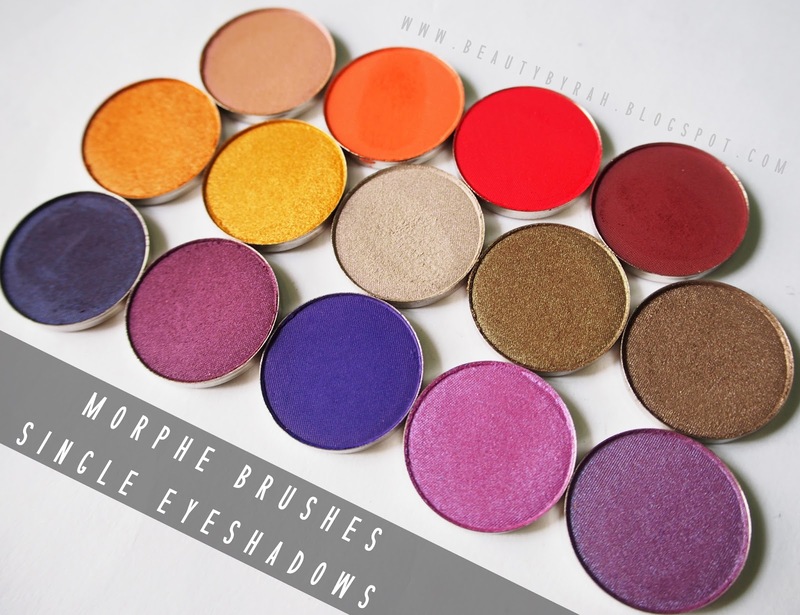 Update: I purchased more single shadows and more swatches can be found here! I got them off here. 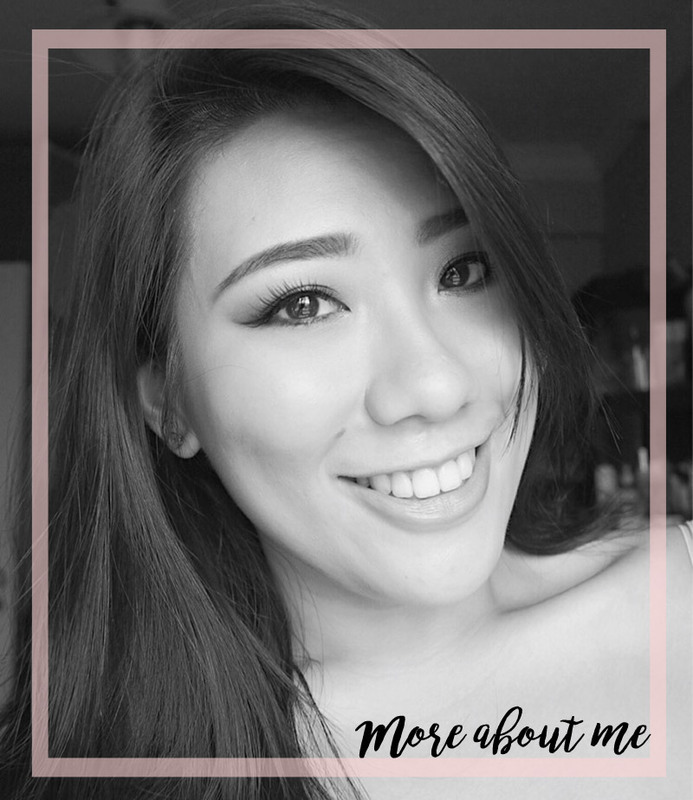 Thank you so much for dropping by and I hope the swatches and review helped you in some way! Have a great day ahead my loves! XO.